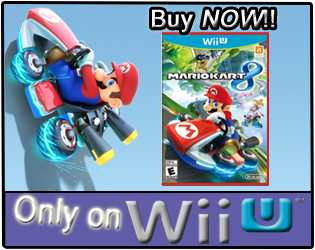 Data shown for U.S. Wii owners. Mrs. Coffee and I did use the Everybody Votes Channel pretty consistently after Nintendo released it, and we had a good number of votes racked up, but then we just stopped using it on a regular basis as there didn't seem to be really point to voting. Bean 1 has found the Everybody Votes Channel in recent weeks, and changed out all of our Miis and even the language setting on it recently. 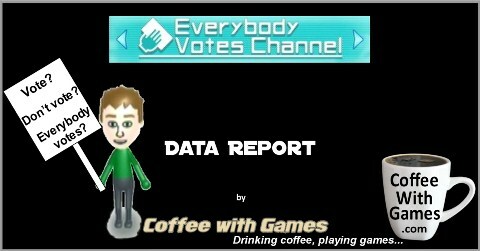 I'm not sure what happened to our older Miis vote totals, but I hope they are around somewhere! Feel free to share your thoughts below, keep them civil (no name-calling! ), and if you want to try and convince me to go and vote today you can do so. If you don't want to do it in the comments, you can always email me. I quit using the Everybody Votes Channel a LONG time ago =D. Oh, and I didn't see Vermin Supreme on the ballot!? I mean, I could have written his name in, but really he should have already been on there =D. Never voted in my life. Never will. I used to hit up the voting and MiiContest channel (whatever it's called) a good bit, but haven't in years. Am thinking those channels may need WiiConnect24 in standby (? ), which I've also turned off to save the Wii's lifespan. (heat) But overall I applaud Nintendo's effort and hope channels like that continue. You know, I served on a jury 2 years ago, and I really enjoyed it. I think it shows (showed) why the system is set up the way it is, and why you should always ask for a jury trial...getting 12 people to agree on anything without physical video evidence, voice confirmed, DNA proven evidence...probably not gonna happen! It's interesting about being registered to vote being tied to Jury Duty though, I'm not sure how they have it set up here, I just know you can be selected I think once every 2-3 years, if you have already been chosen...they give you a "break" from the system for a while. Principles. Sticking to them. I like it! 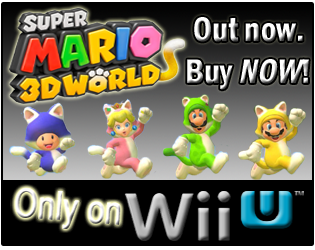 "No worries on the WiiU either way. People elated/justified that their candidate won will ride the election high and spend money despite unemployment rising. Disgruntled citizens on the other side will sew their troubles by retail therapy, WiiU-style..."
Ahh, the "shopping helps my depression" idea, could be true...I just don't know with the point before that, "unemployment rising"...then again, when you have negative savings happening, I can see it happening. I'm in a battleground state, one Obama won in 2008, but it predicted to lose this time. 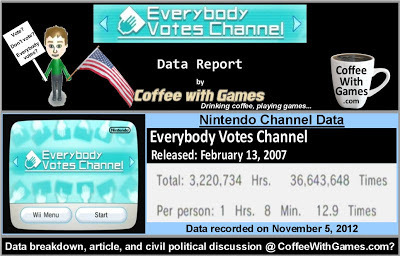 I told Mrs. Coffee perhaps the results would be the difference of only a few votes, for once, and we could get on TV...make sure I bring a customized "CoffeeWithGames" mug and tshirt for free site hits!